with the sage in the backyard orange tree story! Yet this year, the oranges are bitter; even the squirrels toss them away. 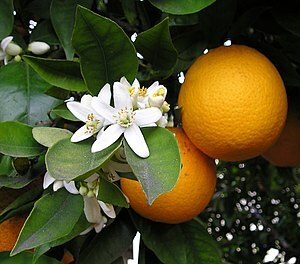 Right now, the tree has oranges on the branches and fresh new blooms all over it, as well. I guess we should pick the oranges to make room for the new, but it hasn’t been on the to-do list yet. What keeps occurring to me is the faith of this 20-year-old tree. It doesn’t seem to be in mourning for the bitter oranges. It is filled with optimism about the future–abundant with sweet smelling blossoms. I believe it isn’t questioning what it did wrong or blaming us for not being better stewards. It is just living, moving forward, and being a tree, preparing for the sweet fruit to come. What a lesson this is for me. How often I have given all of my focus to my “bitter oranges.” How easy it has been to hold tightly to the times I have felt misunderstood, unsupported, unseen. I’ve dissected every membrane of each orange, looking for reasons, for answers, for justification. A business relationship that failed, broken apart by different expectations and a lack of honest communication. A family relationship frayed by differing values. A friend who discounts my viewpoint. I have so tightly held to my hurt, my indignation, my shame. I filled my basket with these bitter oranges and carried them with me everywhere I traveled. A heavy load, indeed. Karen Mead is an alchemist, an explorer and a fellow traveler on this journey of life. Visit her blog, The Peaceful Journey , or check out her website, A Peaceful Path .